If you are a novice rider, or are just looking to take things slowly, you have your choice of 2 locations. The first and main center is based in Avlaki, near Kassiopi in the northeast part of the island. 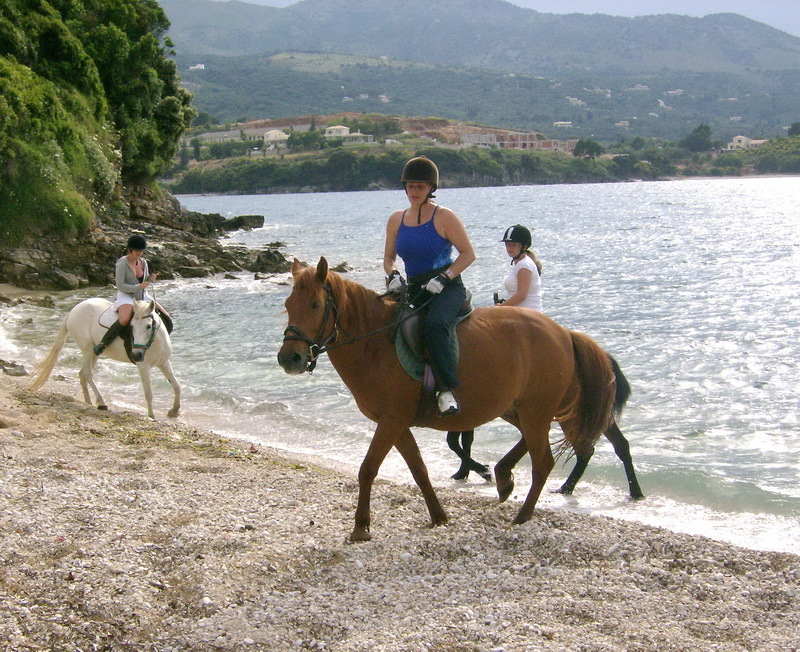 Riding along natural forest tracks and trails, with stunning views out to Albania across the channel, this ride takes you down to a beautiful little beach, where you are able to stop for photographs and to allow the horses to wade in the sea, before returning to the riding center. The second center is based in Issos, in the southwest portion of the island. Again taking in some glorious scenery, this ride goes along sandy trails, through sand dunes, with the nature reserve surrounding Lake Korrision on one side and the beaches and sea on the other. This area is well known for its beauty, and also the fact that there are many trees and plants that are indigenous only to this area of Corfu. You can also often see flamingo and other migrating birds on the lake. After a stop for photo opportunities, the ride then takes you back along the trail to the riding center. Both beginner options offer a choice of 2 locations, last around 1 hour and are done only at a walk. The advanced level ride is aimed at experienced riders, those who are capable of trotting and cantering on trails. Lasting around 1-hour and 40-minutes, this ride takes you up and down some demanding trails reaching some of the more secluded beaches. This is a fast, fun and exhilarating time for the advanced rider with a good amount of trot and canter, even a gallop if the terrain permits. This ride takes place only at 9am due to the heat later in the day, and is done only at the Avlaki center. Weather permitted you will have the option for swimming at the amazing Avlaki beach or explore "Erimitis". So if the sun is sinning do not forget your swimwear. Also, the area is offered for a snack or lunch at one of local taverns where you can taste fresh fish or traditional corfiot dishes. At time of booking,you must provide your hotel name and then you will receive a ticket voucher with the pick up time and the closest to your hotel pickup point.